On Friday afternoon, I was wandering around my neighborhood, as I am wont to do, and I made my way over to the Barnes and Noble to discover a madhouse. 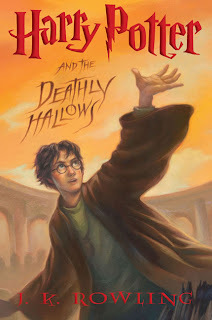 People were running around in wizard costumes and Harry Potter scarves, lining up to get a wristband that would later allow them to line up and buy the the seventh and final book in the series, Harry Potter and the Deathly Hallows. I don't read novels, even when my novelist friends pile heaps of guilt onto me, so I am not a part of the special club to which all Harry Potter fans must feel they belong. But I have to admit that being inside that store, watching all those people of all different ages wait around in great anticipation for a piece of literature, was kind of exciting. I put myself in the mindset of a child who had read all the books and had been looking forward to the last one for a very long time—and, finally, the day had come. I got a little bit emotional. Yesterday, I was at Borders Books and read the last page of Deathly Hallows. I had already read all the spoilers online, but I wanted to get a sense of the writing and the closure fans must feel when they finish. The last page is rather moving and unexpectedly layered in ways that make you simultaneously happy and sad. I'm glad I took all that time to read one page of the Harry Potter series. For me, that's quite a commitment.